Lilac and grey are just the perfect colour combinations for a wedding and are set to be the new trend for 2019 weddings too! 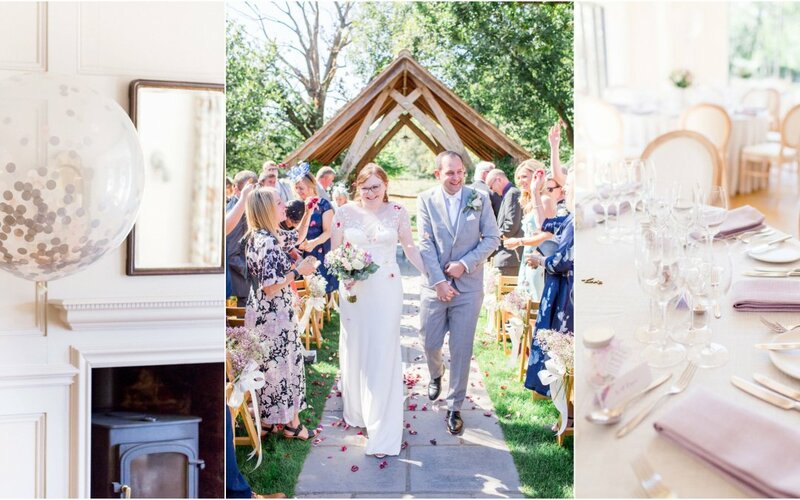 Wearing a Suzanne Neville gown, my gorgeous Millbridge Court bride is totally ahead of the trend and it was so lovely to see such pretty powdery shades for a summer wedding. Their day was extremely elegant, with Vikki wearing a beautiful Suzanne Neville gown paired with some sparkly Charlotte Mills shoes. Adam and his groomsman wore a soft grey Moss Bros suits with powder pink ties. They decorated their day with an array of lilac and pink roses by Tracey’s Florist, displayed in white jugs to give a soft but elegant country garden feel. Giant balloons from Bubblegum Balloons also filled their venue and made for some fun evening shots when the sun was gold and glowy. Vikki & Adam said their vows in a very emotional, happy and sunny ceremony outside under the arbor at Millbridge court. Guests played giant Jenga on the lawns and delighted their taste buds with gorgeous food from Kalm Kitchen. After some excellent speeches and a giant flying fish (scroll down to make sense of this!! ), the couple cut their beautiful cake lovingly made by Ellie form Milk Street Kitchen and danced the night away to the glow of twinkly ‘LOVE’ letters.